I think a lot of cooking scrummy nutritious food from scratch comes down to having tricks up your sleeve. I rarely have the time to cook for long on weekday evenings but with a few staple ingredients always in the store cupboard and a little in the freezer I manage to put food on the table I’m proud of and that the children love to eat. This is one of my speediest supper fall backs and making the sauce takes less time than boiling the pasta to go with it. There is always more than I need for three so the leftovers go in sandwiches or as a base for a pizza. It works equally well as a dip or a side for fishcakes. The recipe uses Greek yoghurt. 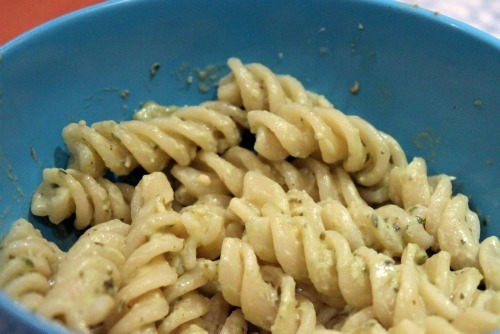 If using cold you could substitute for natural yoghurt but this will not stand up to the heat of pasta. Creme Fraiche would be a good substitute for a sauce on hot food. Put all of the ingredients into a small blender, the bowl attachment of a stick blender is ideal. Whizz until a smooth gloopy mess. Stir through pasta or serve as you please. 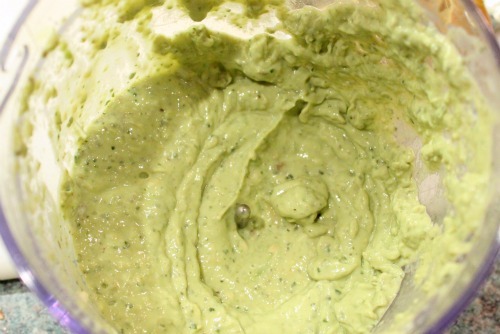 To make by hand smoosh the avocado and lemon juice together in a pestle and mortar or with a fork in a bowl. Add the basil finely chopped and stir through the yoghurt. Keeps for a couple of days in an airtight container in the fridge. Yummy! I’ll be making this for my baby, she adores avocado! Thanks for the great recipe ideas. Hope it goes down well!